Hello again! We're still not past this virus (I've heard from many of you that it's bad where you are too!) but we're coming through the other side finally. Turns out our kiddo has pneumonia, but they caught it really early, thank goodness. I'm just glad he's on meds and on the mend. Man, this was a rough week! 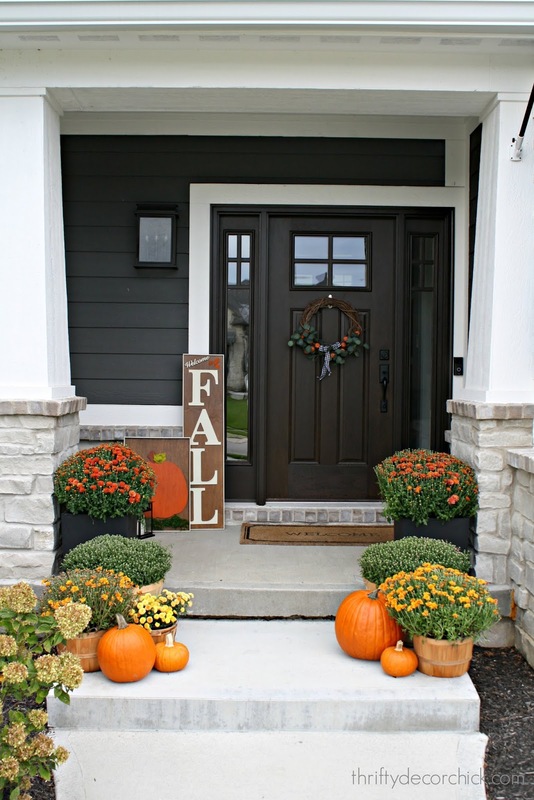 Between the doc appointments and naps, I got my fall porch finished up and I'm excited to show you. 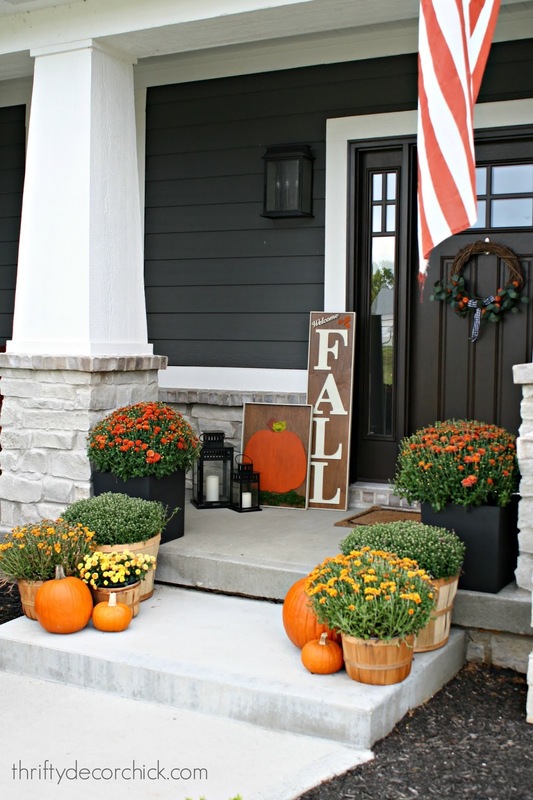 You'll have to bear with me every fall and Christmas because the porch will always be decked out...it's one of my favorites about this house. LOVE IT. 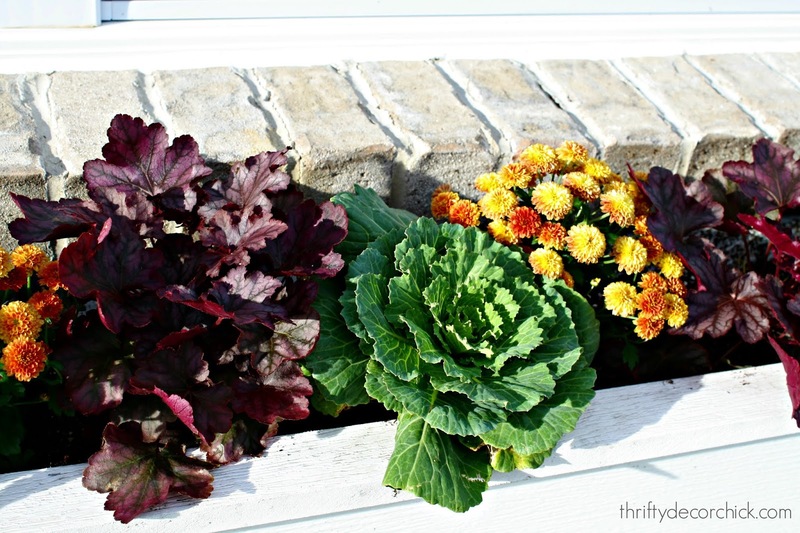 I couldn't find smaller mums for the window boxes but finally found these at Home Depot. They just happen to be my favorite. They're the puffball version (my technical term) and they are so pretty! I've found them in the larger size in the past and just adore them. 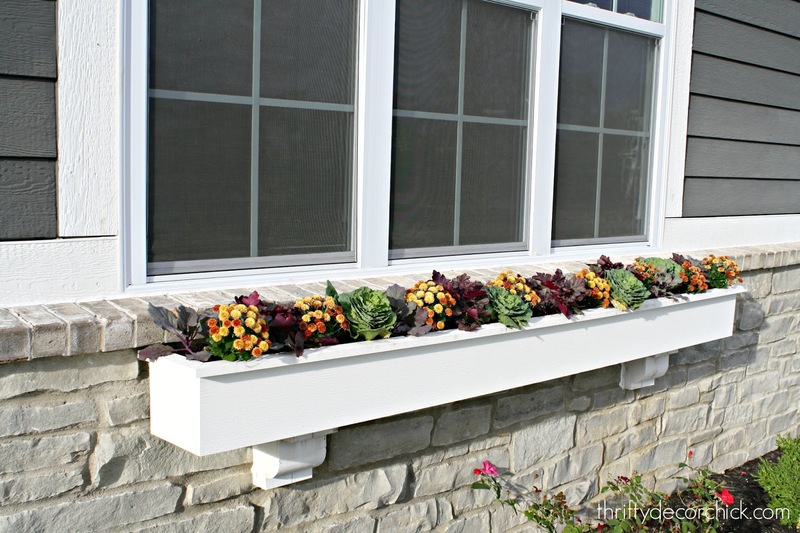 (Check them out on our by our old outdoor fireplace here!) These were on sale for only a buck each at HD! The purple, green, orange and yellow work really well together. Man, the mums are slooooow to open up this year, right? Is it just Indiana? 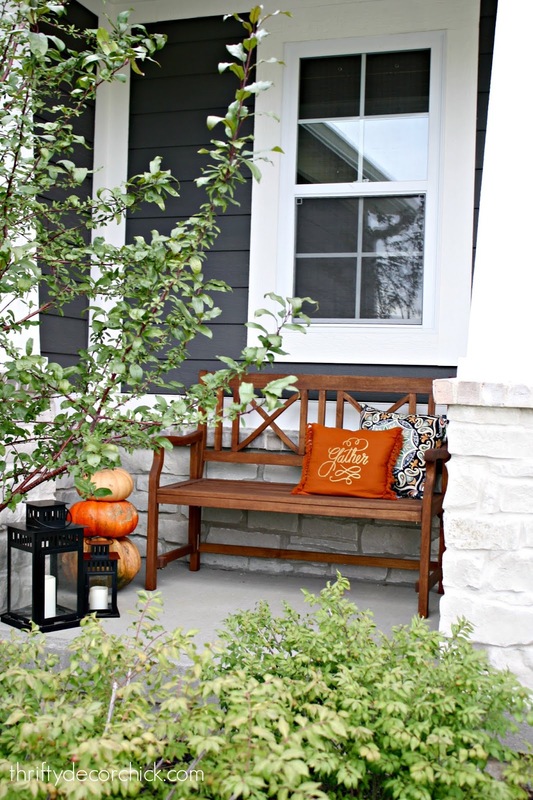 That gather pillow used to be a placemat -- my little hack turned it into a seasonal pillow. 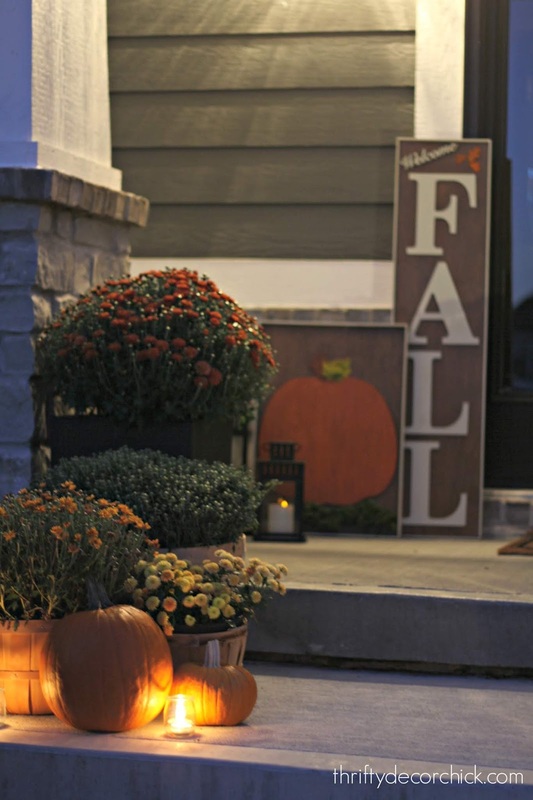 Super cheap way to add a fall touch! 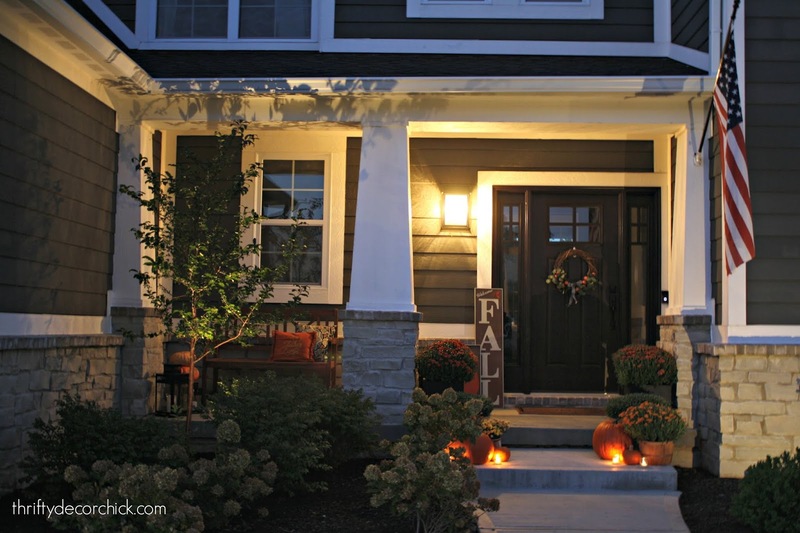 Check out the DIY landscaping light tutorial here if you're interested in adding similar lights to the outside of your house. Have a great weekend my friends -- does anyone have any fun plans? We're going to get plenty of rest and heal up around here! I love your porch. It looks so welcoming! 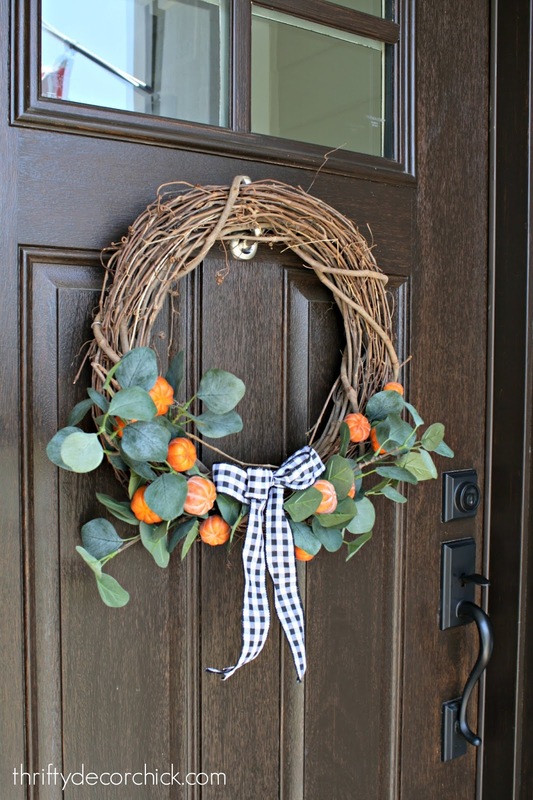 I loved the wreath so much I bought supplies to make one. Thanks for the inspiration! As usual, I love it!!! Great job. 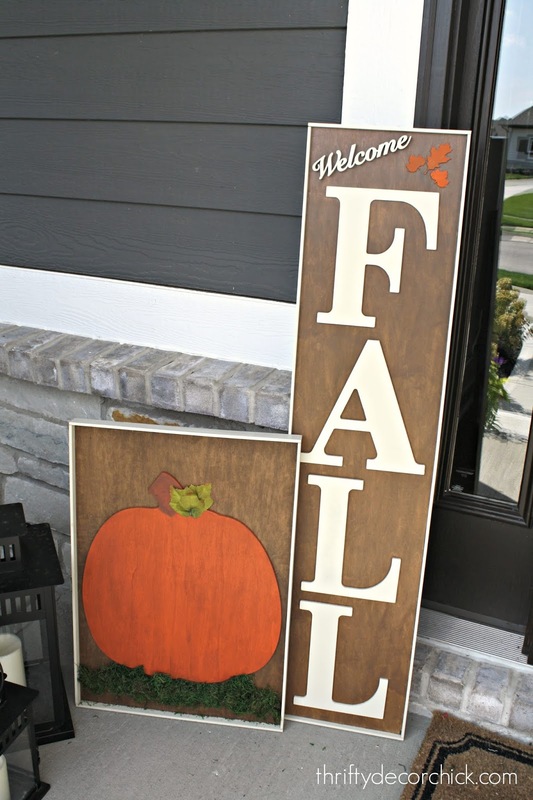 I love the porch and the signs are super cute! 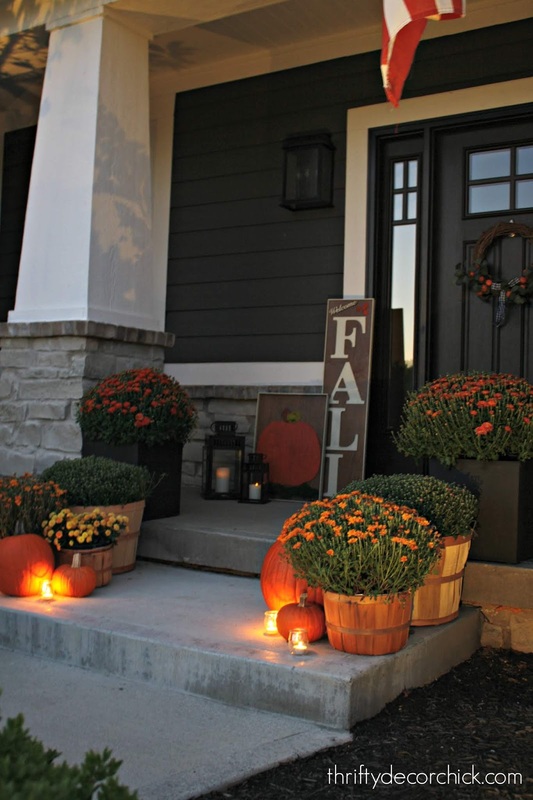 Quick question-where did you find the wooden baskets that the mums in the front are in? Thank you for the inspiration! Thank you! Those were from Hobby Lobby! I caught them half off. That's awesome! Thanks for letting me know! 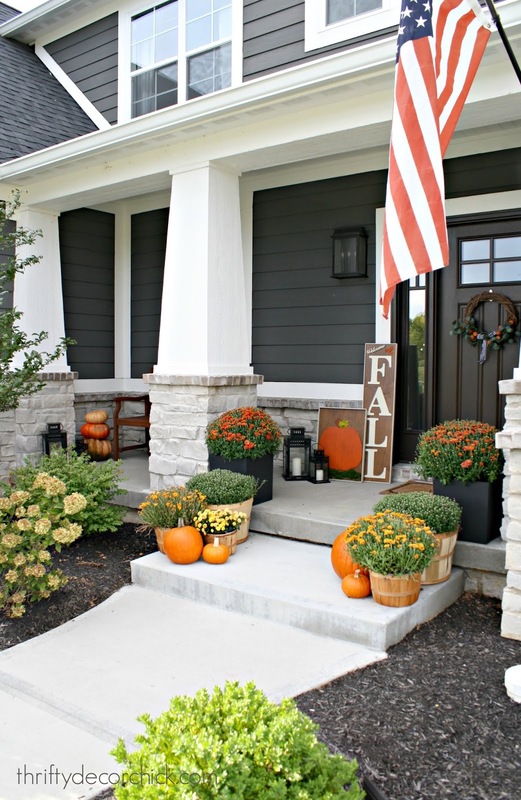 Porch is super cute! I live in Michigan and still getting over pneumonia....going on 5 weeks of head cold that went into my chest. Feeling better but it's wicked! I hope you all heal up over the weekend....take it easy and rest a lot. looks great. i hope each day your guy gets better. Absolutely beautiful!! You are so talented. 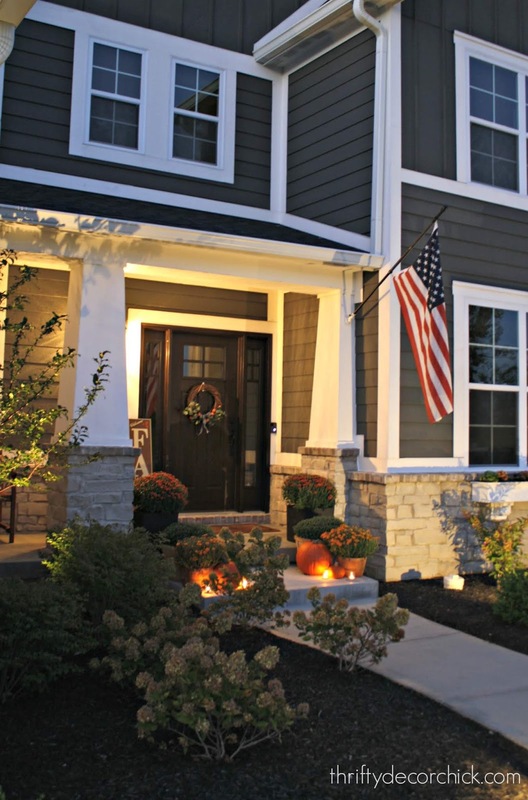 If you don’t mind, what are the colors used on the exterior of your house? I just love your choices. Hope you and the family are well soon. Bless your sweet son! Thank you Vicky! The gray is called Knight's Armor from PPG paints and I believe the trim is Pure White by SW.